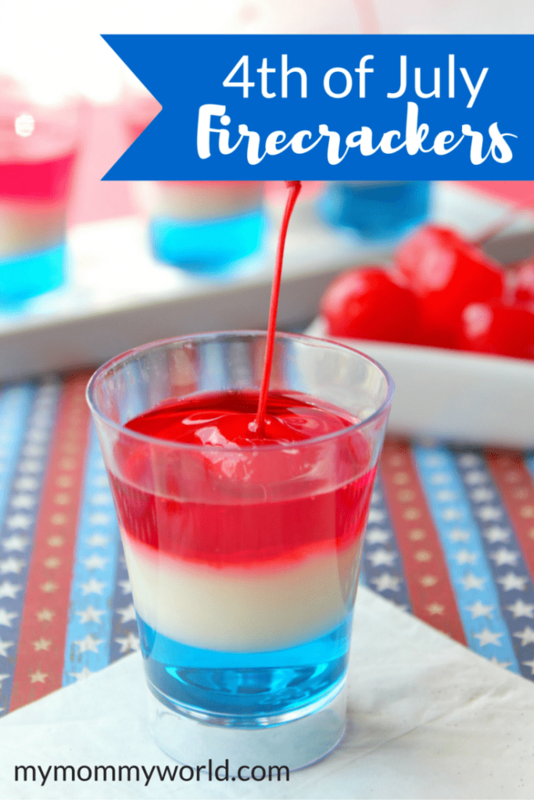 If you need a patriotic dessert for your next Fourth of July party, try this fun recipe for 4th of July Firecrackers. The red, white and blue colors of this no-bake dessert resemble the American flag, and the kids are sure to love eating its yummy layers…and the cherry on top! The 4th of July has always been one of my favorite holidays to celebrate each year, so I like to take a little extra effort to make a special dessert to serve to my family and friends. Although it looks a little complicated, these firecrackers are actually pretty easy to make! This recipe makes about 20 individual firecrackers if you use the small shot glasses like I show below, so feel free to double or triple if you need to feed a bigger crowd. You could also layer your gelatin in bigger glasses if you don’t want to use shot glasses, but it would yield a smaller number of desserts. 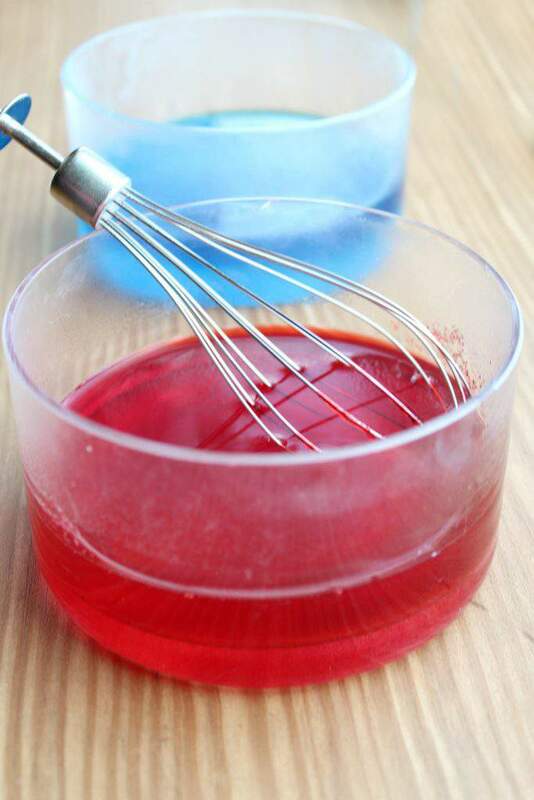 To get started, gather together your ingredients: one box blue Jello (Berry Blue), one box red Jello (Raspberry or Cherry works well ), 1 package plain gelatin, boiling water, milk, sugar, vanilla and maraschino cherries. You’ll want to start by dissolving your Jello flavors in separate bowls with the boiling water. Make sure to stir well to dissolve the gelatin completely, then set aside to cool while you work on the white layer. For the white layer, begin by sprinkling the packet of unflavored gelatin over part of the milk. Set that aside while you heat the remaining milk in a saucepan until it reaches a simmer. Take the pan off the heat and add the vanilla and sugar, then add to the gelatin/milk mixture and let cool for several minutes. Spoon a few teaspoons of blue Jello into the bottom of your shot glasses and then place them into the refrigerator for about 15 minutes to partly set. Next, spoon a few teaspoons of the milky gelatin over the blue layer and refrigerate for about 10 minutes. After 10 minutes, take the cups out and place the cherries directly on the white layer, then place back in the refrigerator for about 2 minutes. Finally, spoon a few teaspoons of the red Jello on top of the white layer, covering the cherry, the refrigerate again for a few hours, or until fully set. Start by boiling water in a small saucepan. In small bowl add 2/3 cup boiling water to berry gelatin mix; stir 2 min. until completely dissolved. Repeat in separate bowl with cherry gelatin mix. Allow to cool. In another bowl, add ¼ cup of milk and sprinkle in 1 envelope of unflavored gelatin; let stand 5 min. Bring remaining milk to simmer in saucepan. Remove from milk heat; stir in sugar and vanilla. Add to plain gelatin mixture; stir until gelatin is completely dissolved. Cool 10 min. Spoon berry gelatin into 20 (1-oz.) plastic shot glasses, add about 2 tsp. to each. Refrigerate 15 min. or until set but not firm. For the next layer top with unflavored gelatin mixture, adding about 2 tsp. to each cup. Refrigerate 10 min. Insert cherry, stem end up, into white gelatin layer in each cup and refrigerate 2 more minutes. Finish the top layer with cherry gelatin, add about 2 tsp. to each cup. Refrigerate 2 hours or until firm. A few boxes of Jello and some patience with the refrigerator makes this fun and patriotic dessert! These 4th of July Firecrackers are sure to be a favorite of everyone who tries them. I hope they are the hit of your next 4th of July celebration! These are so cute, I know my family would enjoy them. 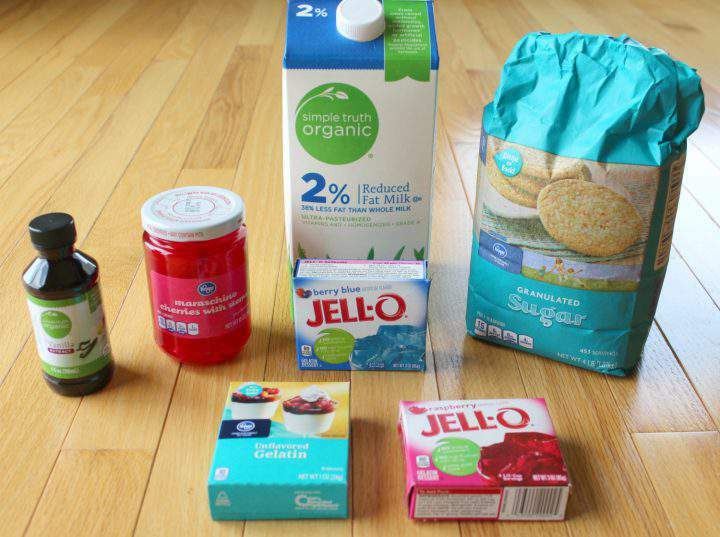 My kids love gelatin and I’m sure I could make them dairy free using coconut milk or soy milk. My kids last week made their own banana cream Popsicles and colored them red, white and blue in layers. They turned out really good and they still have a few left they are enjoying this week. This looks like a fun dessert, Erin! 🙂 It’s hard to believe that we’ll be celebrating the 4th of July in a few short weeks. Time is flying! I know…it seems like spring just started!